Well, like it or not, the summer heat and crowds have arrived in Florence. It feels like summer came out of no where this year. It got really warm in Florence really fast! And where did all these tourists come from? While I am not ready for the intense sun, high temps, and lack of air-conditioning that characterize Italy in the summer, I am ready for some beach getaways and summer style. 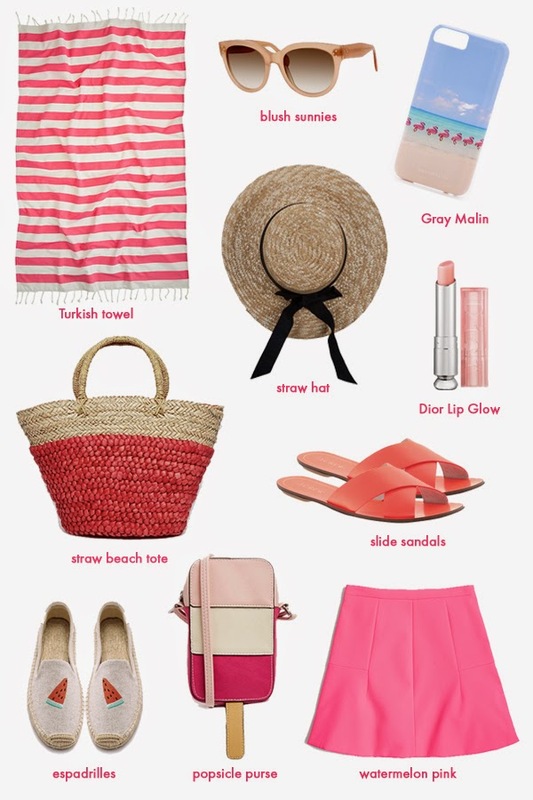 I have rounded up a few of my summer style essentials above (notice a color theme? ), some of which I can manage to get here and some of which I will have to lust over from overseas. If anyone knows where I can get Soludos in Europe, please let me know! Next weekend I will be heading down for three days in the Amalfi Coast (yay!). It won't feel like summer until I spend a weekend strolling through Capri, lounging on the beach in Positano, and climbing Vesuvius. I also can't wait to break out my new popsicle purse (so cute and a steal) with my espadrilles and beach tunic. On a quick beauty note, I was browsing the department store in Florence the other day and the sales lady introduced me to Dior's new summer glow collection. I love it, especially the lip glow. I also purchased a new gloss that is part gloss and part lip stain. It lasts all day without being overly drying. What are your summer style essentials?